The Powerprox Six Month Braces™ Technique is a radical new technology that develops your teeth into a beautiful smile, quickly and comfortably. In ten appointments or less, completed over approximately a six-month period, wide gaps can be eliminated, and overcrowded or overlapped teeth can be gently moved into a more aesthetic position. Because the Powerprox technique uses a low-force method, the teeth visible in your smile can be moved safely with just light adjustments that cause less discomfort than traditional braces. In addition, no one needs to know you’re having your teeth straightened. Powerprox Six Month Braces placed on the front of teeth are typically clear, to be less obvious. 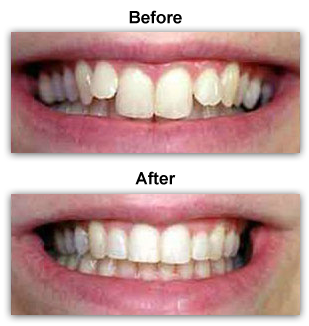 However, lingual braces, which are placed behind the teeth, are often the best option and are completely invisible. Powerprox Six Month Braces are perfect for older teens and adults who want the benefit of straighter teeth without the hassle and appearance of more traditional metal braces. Because the treatment time is shorter, this technique is less expensive than traditional comprehensive orthodontics. Ask us if this procedure is right for you.